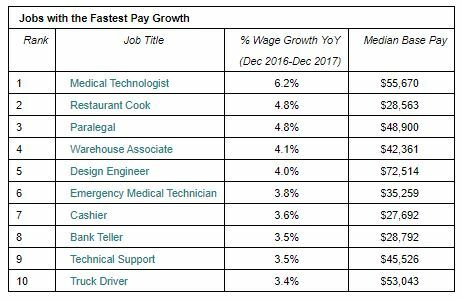 U.S. based job site Glassdoor issued its local pay report earlier this week, revealing an overall growth in the median base pay in 2017, with the truckers seeing a median pay increase of 3.4% overall. According to the study from Glassdoor, the percentage gain for trucker salary raises the average annual pay to $53,043 for a regional or dedicated trucking position. Dr. Andrew Chamberlin, Glassdoor chief economist reports that a raise in pay for commercial trucking falls in line with an overall rise in e-commerce and brick-and-mortar businesses making shifts for success, primarily by employing more on-demand delivery options. "Although the brick-and-mortar retail sector struggled overall in 2017, the industry is shifting its focus towards more pleasant in-store experiences, with sales associates who can help customers navigate a complex product space,” said Chamberlain. “That means the in-store jobs that survive this retail shake-up may be higher skilled — and higher paid — in the future." In comparing jobs from multiple industries, the Glassdoor study also found that truck driver was in the top ten jobs in America with the fastest pay growth rate, alongside positions such as emergency medical technician and paralegal. The study from Glassdoor also addressed the issue of artificial intelligence and automation acting as a disruptor within certain industries, though it did not list a direct correlation within the commercial transportation industry.